PowerBrain units act as inverter and regulatory control units to intelligently manage and serve electricity. PowerBrains can be connected to many electrical sources and provide 230v AC. 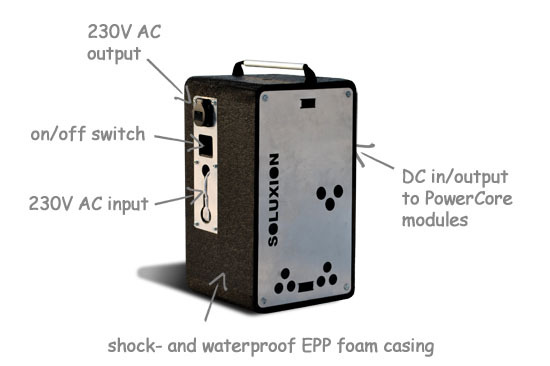 The PowerBrain converts the electricity of the SolarCases or the energy of the PowerCores to 230V AC current, which is the same as the current in the sockets of your home. 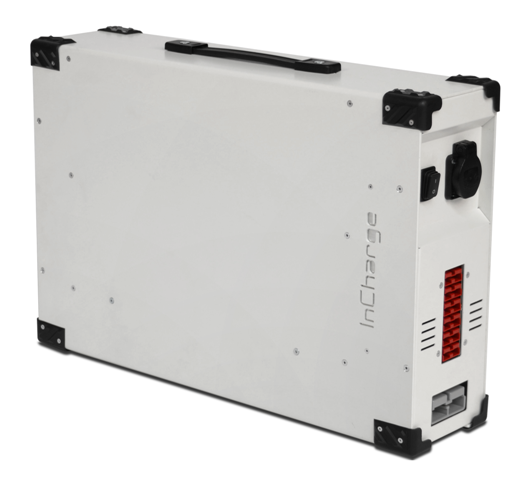 A single PowerCore can deliver up to 1.000W which is enough to run a wide range of multiple devices. The PowerBrain can synchronize its power with one or two other PowerBrains to deliver up to 4.000W, which is the same amount of energy you can maximally access through your home sockets. In theory you can create limitless numbers of independent 4.000W groups. Besides delivering 230V AC current, the PowerBrain also supplies charge current to the PowerCores. It means that our system can easily accept, store and recover energy from many external energy sources such as power from generators, wind energy, water turbines, grid power or any other 230V AC supply.